It's Day 9 of the 12 Days of Giveaway and I hope you have a cup of coffee nearby (or maybe something even stronger perhaps) as there's lots to show you today. There are four different Giveaways with a total value of $200 for up to EIGHT winners. All giveaways close at Midnight on 30 November 2012 ÁEST so you still have lots of time to look around and see what you would like to win. You can enter one giveaway at a time if it's easier. I never get excited about cleaning but when some products arrived for me to try from new company, Simply Clean, I got very excited. I repeat. Cleaning. Products. Excited. Me. And stranger still, I could not wait to try them out. I know, for all you who know me, miracles can happen. Just look at them though. The range is divided into Kitchen, Bathroom and Microfibre Cloths and each product is individually labelled and colour-coded to indicate which area and surface it is to be used for. What a creative yet very practical idea. This pack contains 30cm x 30cm cloths for stainless steel, dusting, glass and kitchen. 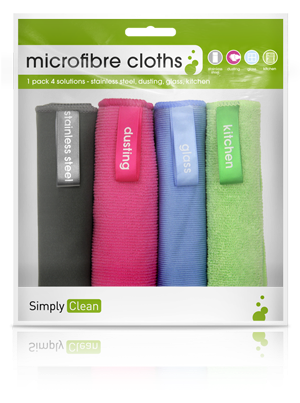 These great products came about when Mum of three, Victoria Fulford, was sick of seeing her family use the cloth she’d used to wipe up the baby’s breakfast mess, to clean the kitchen counter. She decided to do something about it and thus, Simply Clean was born. 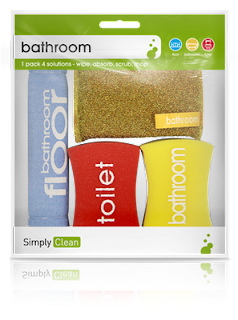 A first of its kind in Australia, Simply Clean products are designed to promote safe hygiene practices in the home and office and help protect users from the risks of bacteria (very necessary given that Mythbusters concluded that the kitchen sponge is the number one source of bacteria in the house). 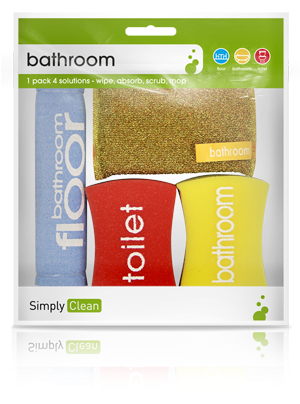 These products are sold in Woolworths nation-wide, RRP $6.99 per pack. For more info, go to www.simplyclean.me And congratulations Victoria, they are really needed. Could you please now do something similar for the hospitality industry at large because they could really do with some help in this area too. 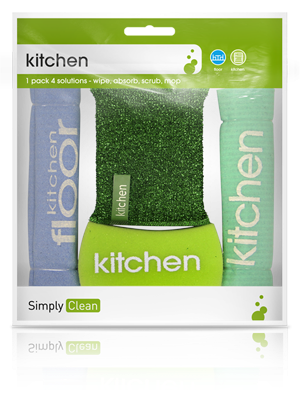 FIVE lucky readers will each win three packets of the cleaning products shown above (RRP $21). Tell me one of your best cleaning tips (I could do with some ideas). Submit an entry form at the end of this post. The next giveaway is from Vinyl Design which sells amazing vinyl products for the home. 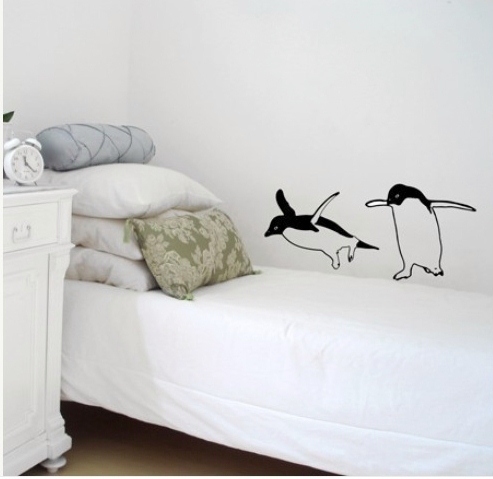 They have a fantastic range of vinyl wall stickers to decorate any space. You can reinvent and transform your home, office, kid's bedroom or playroom, adding color and style to your interiors. Vinyl Design wall decals are made of matt vinyl, a very flexible material easy to apply and to remove. They also sell Vinyl Tees which is their new range of organic men's t-shirt; they're designer and hand printed on ethically made and environmentally friendly t-shirts. They have original graphics, they fit nicely and the light weight cotton is a comfortable to wear. Vinyl Living is their latest projects and includes a range homeware and textile for you and your house: here you will find hand printed canvas bags for your shopping, strong canvas cushions covers and tea towels all designed and produced in Australia! The decals are very easy to apply and they won't leave any marks on`the wall upon removal. This prize pack contains 2 penguins. Penguins size: 25cm height (9,8 inches); plus how to apply instructions. And while we are on the subject of penguins I have to show you this little video my niece took on a school trip to South Africa a few weeks ago. You will want to play this over and over again or perhaps go and win yourself your very own penguins from Vinyl Design instead. Go to Vinyl Design's online store and tell me what product you would like to buy for your home. Submit an entry using the form at the end of this post. 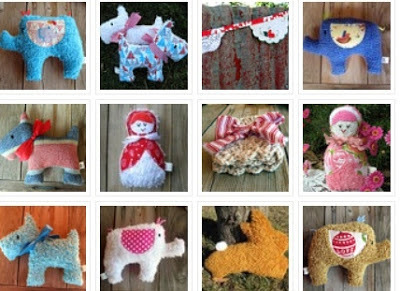 The third of today's giveaways comes from Etsy shop Vintage Chenille. The shop owner, Leah, makes the most stunning quilts and adorable soft toys for children. Leah discovered the craft of patchwork using vintage chenille and began collecting it to make her baby girl a quilt and now apparently just can't stop!! Lucky us! She also can create something especially for you as 99% of her creations are unique because of the character of the vintage fabric. Mmmm, I wonder if she could make me a penguin? One lucky reader will win one of Leah's Christmas themed Scotty Dogs ($19) (yes we have the animal theme going today!) How adorable is this toy! Visit Vintage Chenille and tell me what your favourite item is in the shop and submit your entry at the end of this post. The final giveaway is from Etsy shop Forget Me Not. I love the name of the shop and I love the items in it even more. I think we should all be putting pen to paper again rather than doing everything online. You will find some beautiful stationery and accessories in this store. Forget Me Not has cards, tags, notelets, notebooks and more. I have ordered three different items in the last couple of weeks since I discovered the shop. It is great quality and unique. 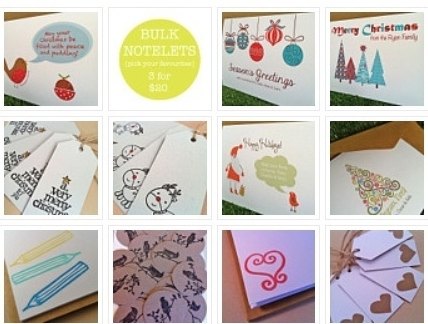 There are some really gorgeous Christmas cards and tags that are original and one of a kind. These products would make lovely Christmas gifts for me and everyone else. One reader will win $40 worth of items of their choice from Forget Me Not. Visit Forget Me Not and tell me what you would like to win. You can submit your entry at the end of this post. Thank you to Simply Clean, Forget Me Not, Vintage Chenille and Vinyl Wall Art for providing their beautiful products for giveaways. My family thanks Simply Clean for giving me such great products to try and for making me clean the house so thoroughly too.